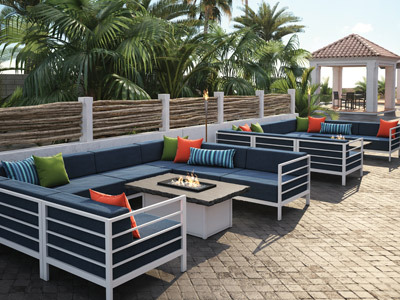 Our Allure Modular and Allure sling collections combine clean, modern lines with strength and durability for weather-resistant seating that is perfect in any outdoor space. 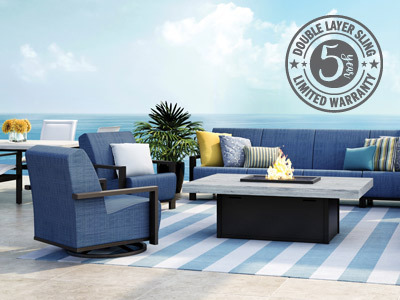 We are excited to announce another industry first: the new 5-year residential warranty on the celebrated our double layer sling and padded sling products. We have expanded our fire table offerings including new heights, top finishes, sizes and frame finishes; we’re also offering our first ever micro fire table base, Nova. 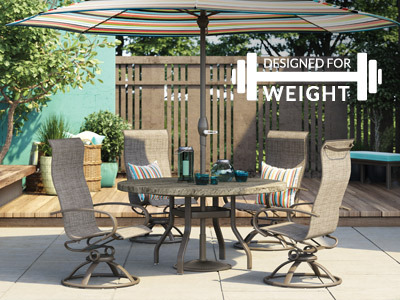 Our "Designed for Weight" collections are made with both aluminum and plated steel, making them ideal for windy conditions. 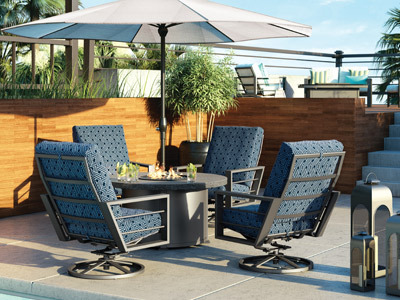 Flip through the 2018-2019 Homecrest catalog and view amazing photography and collection details for all of Homecrest's outdoor furniture products. Enter your state or postal code to find a Homecrest retailer near you.